Thanks. You are certainly welcome to borrow code and schematics for your project with attribution, as I will be publishing all the information about all the hardware and software before I declare the project complete. New updates: improved Android app, debugged Arduino->app data transmission, added diffusers made from the half-height Poland Spring water bottle caps. *bump* Improved a number of problems with the Android control app, including problems with changing modes after powering PartyMode off and back on from the app. Experimented with notifications so that the PartyMode app can have a persistent icon in the status area, which changes based on whether a PartyMode system is connected. 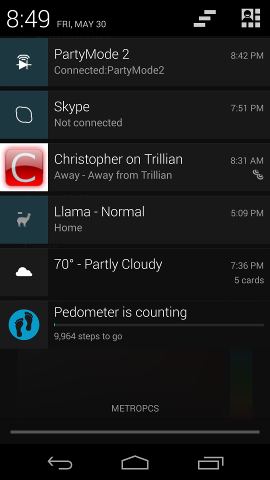 A sample notification can be seen below. 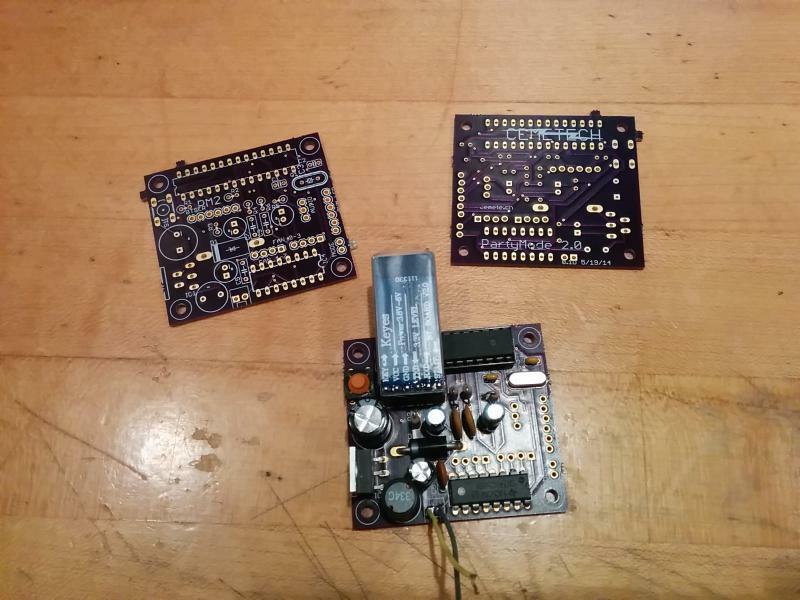 (1) When low-voltage control PCBs from OSHPark arrive on Monday or so, populate and replace the existing breadboard-based controller. 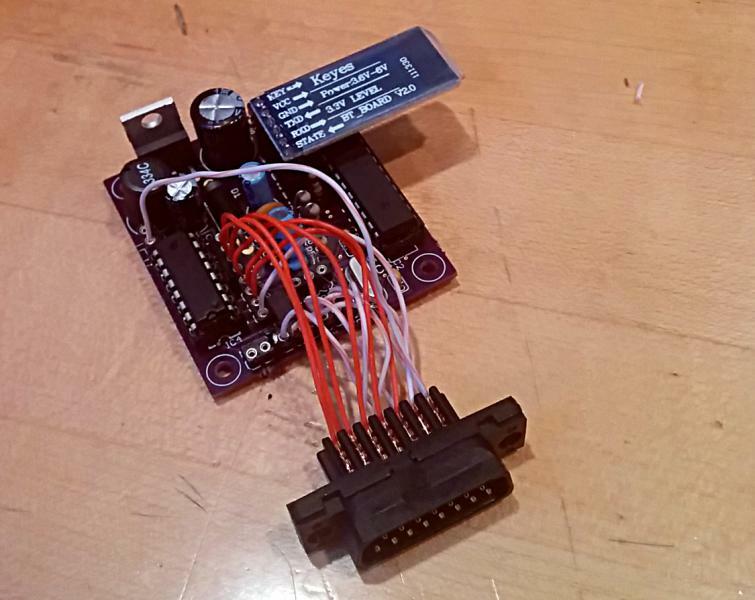 (2) Update firmware on Arduino to stretch out the low-light parts of the fading sequence for Fading Lights mode. (3) Document project hardware and software on Cemetech in the Projects and Archives section. (4) Publish app to the Play store? Or release on Cemetech? (5) Post news article and notify the usual places. *bump* My boards finally arrived from OSHPark, much to my happiness. I started populating one, and nearly finished other than the necessary headers for output wires. I was able to test that the switching-mode power supply is working and produces 5.05V, the Bluetooth module works, an the ATmega appears to boot up properly. I will do more testing tomorrow evening. - Removed incorrect 1uF resistor between 74HC959 latch pin and ground. The Arduino ShiftOut tutorial has an error. 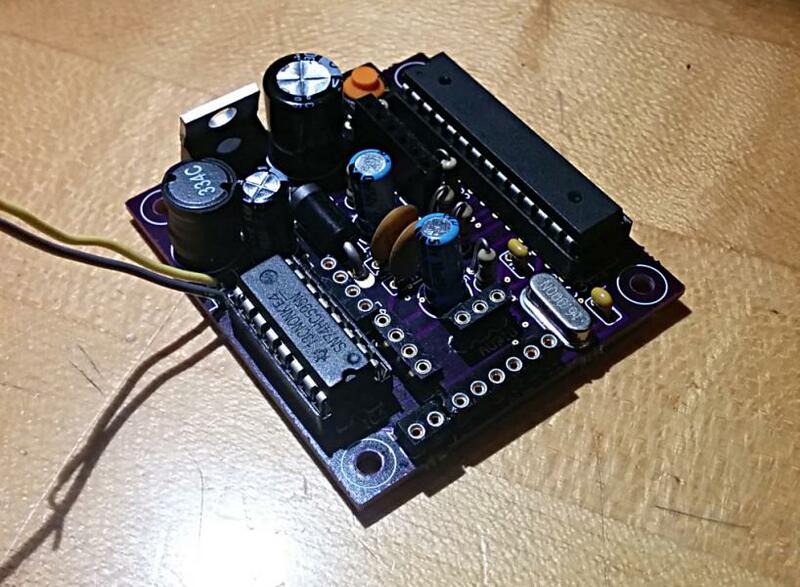 - Added nifty D-sub socket with mechanical wire retention (ie, solderless) for sending the fan and LED signals from this low-voltage control board to the high-voltage control board. 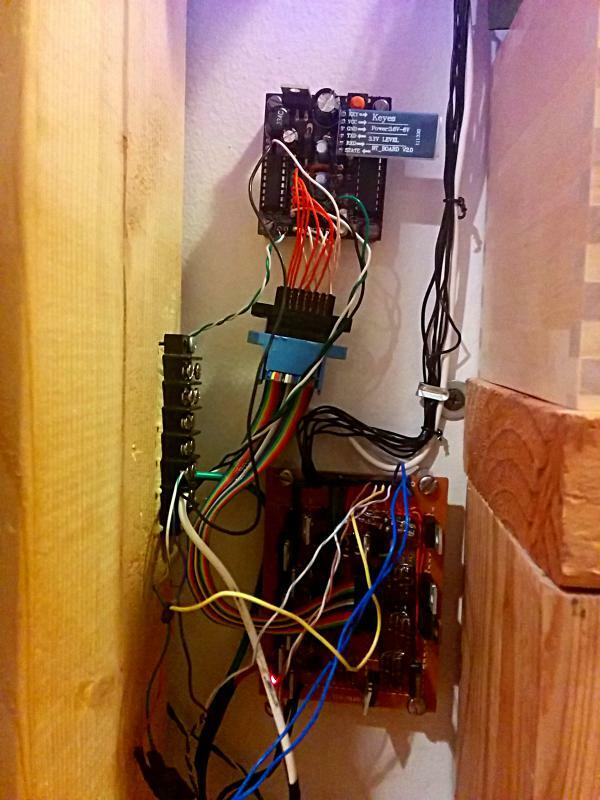 - Finished constructing and testing the entire system. The only thing that doesn't seem to be working right is the MODE button, and I think that's because the firmware has the wrong input pin configured for the button. A history of this long-running project, videos, and documentation will be coming soon. Very impressive work, Kerm! The PCBs look great, too. Now you've built it, are you planning a disco to test it? Looking forward to seeing those. Well I would say that looks marginally more like I won't fry my self on it next time I am over . Very nice Cant wait to see it in action! Also I would have probably used those sockets to begin with. Makes it so you can update the firmware as hiccups arise. I've had a few mini-raves with just me and some good techno, but you're right, I should have a party. Thanks! One of my friends from college is helping me look for more photos and videos of the original PartyMode/DiscoScreens. Thanks! Capturing good video of it is going to be tricky, but I shall try. I always use a socket on the microcontroller. The thing I didn't use a socket on was the SN74HC959 chip, which is just a static logic chip. A yeah that makes sense. I guess rusty soldering skills make that happen? Hey you got it working that is what matters! Techno ftw! What sort of techno? I think I'd rather have my handiwork there for everyone to see; the highest voltage there is 12V, and the highest current is about 300mA, so nothing close to fatal. 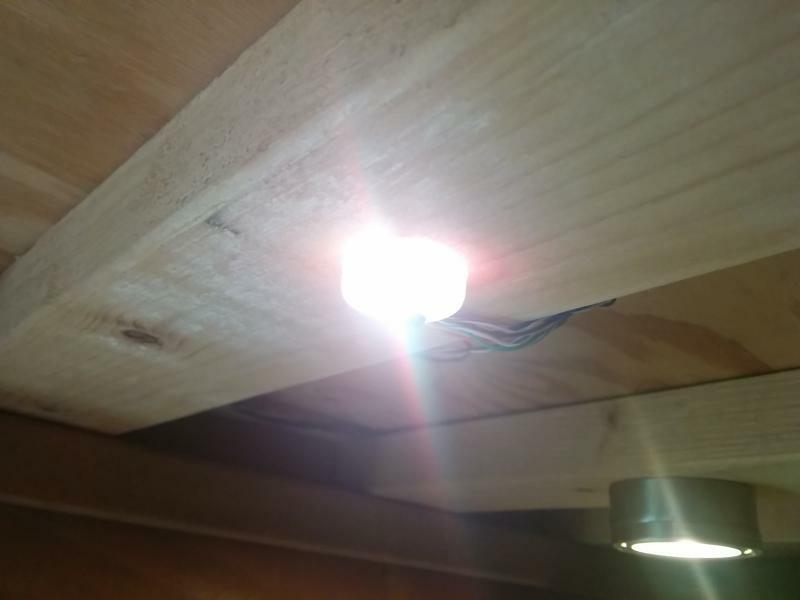 I do plan to tack down that D-sub connector a bit and straighten out the wires connecting the LEDs to the "high" voltage board. Wow! looks amazing. I hope you will be able to put up a video of it in action soon. I look forward to seeing it. Thanks! I threw a quick and terrible cellphone video into #cemetech last night, but I'm hoping to make a much more professional video that covers all of the modes to include with the announcement and information about the finished project. There are 120 users online: 1 member and 119 guests. © Copyright 2000-2019 Cemetech & Christopher Mitchell :: Page Execution Time: 0.146994 seconds.